Striker Kevin van Veen is ‘highly unlikely’ to be involved for the Cobblers in their Sky Bet League One trip to Blackpool on Saturday. The Dutchman has been out of action since damaging knee ligaments on his full debut for Town at AFC Wimbledon on February 10. A transfer window signing from Scunthorpe United, van Veen is making a steady recovery, and is believed to be ahead of schedule for a return, but that will not be at Bloomfield Road this weekend. “I would think it would be highly unlikely for Kevin to be available on Saturday,” said Town assistant boss Dean Austin, standing in for boss Jimmy Floyd Hasselbaink on media duties at Moulton College on Tuesday morning. “We haven’t really seen him on the pitches yet, and he is working very hard with the physios. Aside from long-term injured pair Aaron Pierre and Aaron Phillips, everybody else is fit and available for the weekend, with striker Boris Mathis back in the group after missing last weekend’s Oxford United clash due to illness. “Boris is back after he had the flu last week,” said Austin. “He came in on Friday and we felt it was important to get him away from the rest of the players, as we didn’t want that spreading through the group. 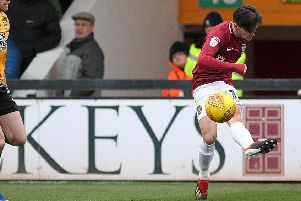 Saturday’s hosts Blackpool are just four points above the Cobblers in the Sky Bet League One table, but are on a good run of form and were impressive 2-0 winners at Portsmouth last weekend. The forecast ahead of the weekend is not very encouraging and there has already been some snowfall on the north west coast, but Blackpool tweeted this morning that the pitch is already under covers.